Carla Takaki Richardson has been intently watching Twitter feeds and social media posts from Japan after the 8.9-magnitude earthquake and tsunami devastated the country's northeastern coast. "It's really fascinating how citizens are creating their own knowledge about the disaster," said Richardson, an anthropology graduate student at UC Santa Cruz. She returned in January after 18 months in Kobe, Japan studying how that city recovered from the 6.8-magnitude earthquake that killed more than 6,400 people in January 1995. Her research focuses on disaster management information systems. "I've been watching since last night," Richardson said Friday. "It's incredible how different I think this experience is." For one thing, the flow of citizen information is dramatically different, Richardson said. Twitter and Facebook posts and e-mail convey information in real time in contrast to Kobe 16 years ago. In Kobe, "everyone who had survived told me the thing they needed the most was information. They had no idea what was going on," Richardson said. Richardson worked at the Takatori Community Center in one of Kobe's hardest hit areas, a working class neighborhood populated with immigrants from Vietnam, Korea, and Latin America. Citizens relied on hand-written newsletters and posters to find food and shelter, she said. One enterprising person cranked up a mimeograph machine. Some ethnic Koreans trucked in radio equipment to set up a pirate radio station. The station, FMYY, still broadcasts today. Some people in the neighborhood resented the national media, believing them to be mercenary and not helpful in conveying needed information. "Kobe is far from Tokyo, the media capital," Richardson said. "We're seeing that now, too. People are tweeting about it, that media coverage is not helping." Richardson said she interviewed one man who had one of the only Internet connections in the area in 1995. He was inundated with requests from concerned people from around the world for information about the quake, since information only leaked out slowly after the disaster. Today the Internet is ubiquitous. She's been receiving e-mail updates from friends in Japan since the quake hit Friday. 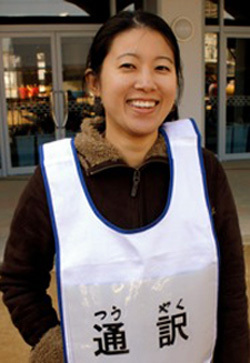 Richardson also said the Kobe quake ushered in an era of volunteerism that Japan had not previously seen. One million volunteers spontaneously flowed into Kobe to help. "There wasn't a history of philanthropy and volunteerism," she said. "Now there is a changing dynamic relationship between people and the state." She expects that will continue as the quake- and tsunami-stricken area begins the long road to recovery. Richardson hopes to return to Japan in June after teaching a spring quarter class at UC Santa Cruz called "The Anthropology of Risk, Crisis, and Disaster," an ethnographic look at disaster response. "We'll have lots to talk about," she said. Her research is funded by a Fulbright-Hays fellowship, the Social Science Research Council, and the National Science Foundation.